Springmoor is ready to pamper you! 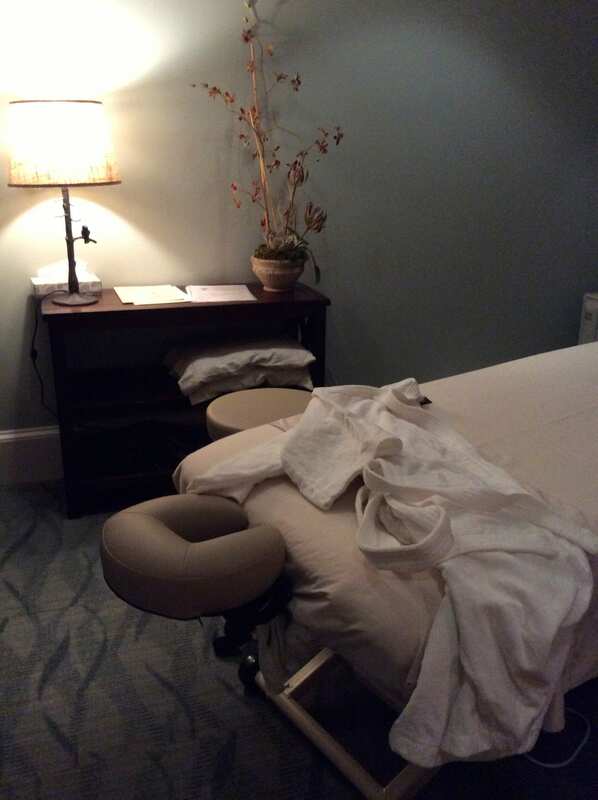 There are three massage therapist, three manicurists and six hairstylists in our two salons. Deep tissue massages, pedicures, color and cuts – our experts make you feel like a king or queen while you are sitting in their chairs. 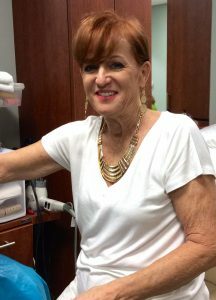 Barbara Surface, a Trager certified therapist, can help release the stress in your muscles after a surgery, illness or any other mental or physical trauma with her gentle touch and natural movements. The Trager Approach increases physical mobility as well as mental clarity. She can help ease your back pain, release shoulder stress, open your diaphragm for easier breathing and relax your mind. Her soft voice, music and lighting will help relieve all of your tension. You can schedule a series of weekly or bi-weekly sessions with Barbara. She is happy to bring her portable table to your apartment if you choose to de-stress in your own environment. If you prefer a deep tissue massage, Ed Sansbury is on campus too. His technique is best suited to release chronic muscle tension. The focus is on the deepest layers of muscle tissue. The journal of Clinical Psychiatry has found “that massage reduces stress hormone levels and heart rate while boosting mood and relaxation.” Over time, deep-tissue massage therapy can help break up scar tissue after surgery. It helps rehabilitate muscles after an injury and relieves tension, headaches and tight muscles. Lymphatic massage can help too. This gentle technique is Vera Marquardt’s specialty and designed for to help restore function to the lymph system and balance the body. When your lymphatic system works well: proteins, fluids and bacteria are filtered correctly through your system. Swelling, feeling tired or susceptible to colds are lessened with the massage, leaving you with a stronger defense against illness. Vera’s NST technique will have you feeling like your healthy-self very quickly! The three massage therapist, Barbara, Ed and Vera can schedule an appointment for you Monday thru Friday in our Pathways Wellness Center Spa. The music is soft, the lights are low, and the temperature is warm; all helping your muscles relax even before you are settled on the table. Our fitness instructors, physical and occupational therapists all suggest that a session with one of these three will help make you feel like a king or queen. Phyllis, Denise and Terry are in our North and South Village Salons. 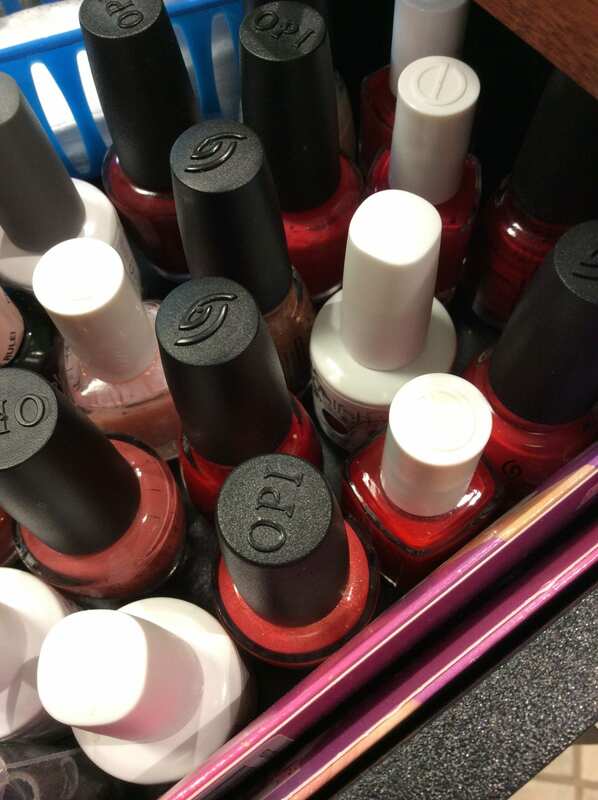 They provide manicures, pedicures, acrylics, gel nails or simple nail clippings to our residents. 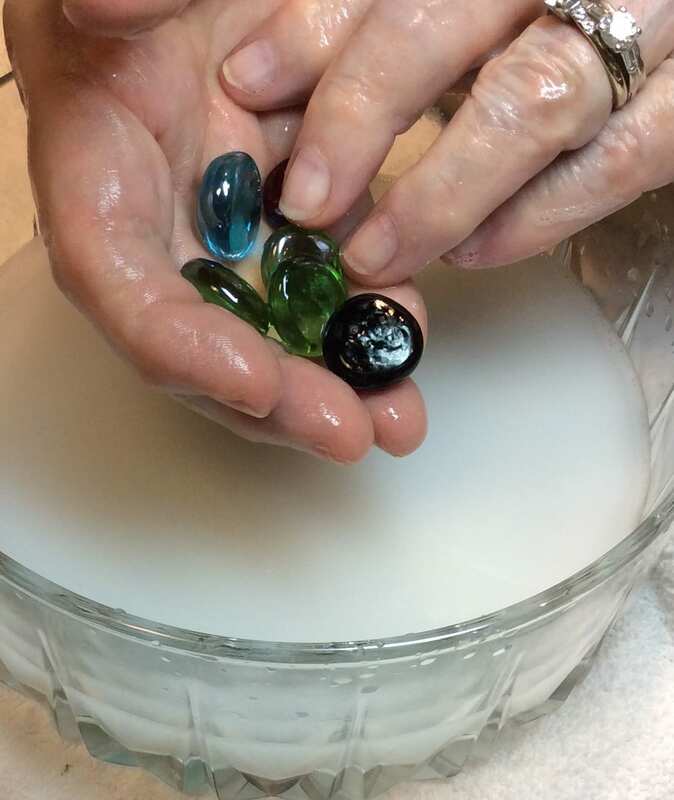 Springmoor resident, Eileen, enjoys playing with the smooth stones and marbles in a warm nail solution while her toenails are being painted a beautiful shiny new red. The conversation is light – usually about family and current events, says Phyllis. This week, it has been about the tremendous athletes competing in the Olympics. Lately politics is the big topic amongst those sitting under the dryer or having their nails clipped. The stories told and the history between the residents and the staff is very special to both. The group even broke out into a hearty round of “happy birthday” when Springmoor resident, Mary Lou walked in. 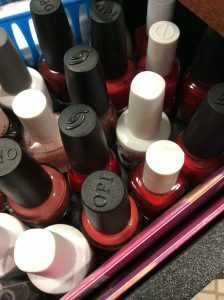 The salon has a special way of making you feel like a pampered princess. Betty Weaver, our Salon Manager, has been at Springmoor for thirty years. 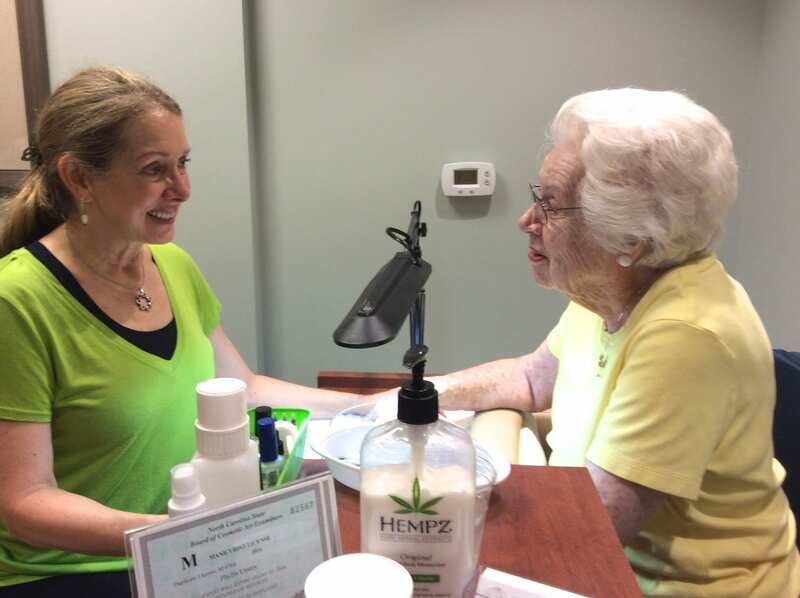 Her dedication and love for her clients brings tears to her eyes when she describes the men and women that she visits with every day. 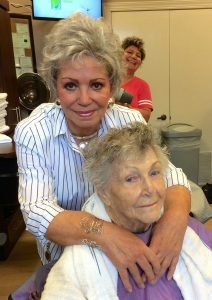 She and her daughter, Julie are in the North Village Salon coloring, cutting, styling and trimming. Julie also works and travels with Tanas Hair Salon. She brings new products, updated techniques and new trends back with her to keep our residents updated on the latest hairstyles. Wanda and Cathy are in our South Village Salon. Their tender touch, soft scalp massage and warm dryers can put most any resident into a comfortable relaxed state. All of the stylists say they encourage new residents to continue to see their local hairstylist for as long as they can. The history they have with them is important. When it becomes easier to transition to the Springmoor Salons, they are delighted to have you join the family. The prices are similar if not lower than most any salon you will visit in the area. Whether you are scheduled for a weekly visit or every few weeks, the welcoming atmosphere is always a great place to be. 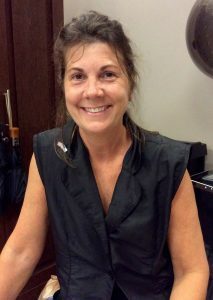 Wanda Hill, our South Village stylist, has been with Springmoor for eleven years. Along with Cathy, Brenda and Bonnie, our Springmoor stylist team, they all love to visit with our residents. Hearing about their children and grandchildren is the highlight of their day. And of course, sharing the stories is the highlight of being a grandparent! She is looking forward to a makeover with one of her favorite clients. It’s time, Eileen says for a new do! The two have picked out an updated cut that is easy to style. They can’t wait to reveal the new look next week. The Salon and Spa have a dedicated group of employees. They all agreed that the best thing about being here is THE RESIDENTS. We all agree that they make us feel very special when we are sitting in their chair. Being treated like a king or a queen for a few hours is the best afternoon activity anyone could ask for. Let the pampering begin! ← Mark Your Summer Calendar!